Hi All – Just finished my newest tutorial, and am really excited about it! The primary project in this tutorial is a progression of my Swarovski Crystal Bracelet. It assumes you either have that tutorial, or are familiar with that style of bracelet. Only the modifications to the ends of the bracelets to fasten to the Cab Top Clasp are covered, not the entire Swarovski Crystal Bracelet tutorial. When finished the Cab Top creates a nearly INVISIBLE clasp. 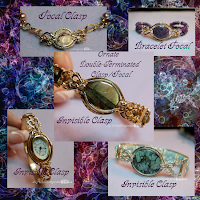 This tutorial teaches you step by step the techniques needed to create the Cab-Top Invisible Clasp, along with variations that include the Multi-Strand Bracelet, the Watch-Top Invisible Clasp, and the Ornate Focal Clasp for necklaces. This is an advanced tutorial, though if you’re comfortable in the basic skills set, the steps are detailed enough a patient intermediate level wire worker can accomplish these projects. I hope you get a chance to check it out! 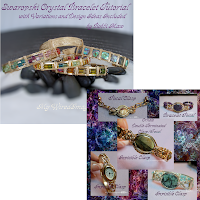 Also available in my Shops – a Bracelet Tutorial Package for both the Swarovski Crystal Bracelet and the Ornate Double-Terminated Focal/Clasp. Purchasing them together saves you 25%! Many, many thanks to Perri J ShaktipajDesigns for her continued support, friendship, and wisdom. Background art in the cover photo, courtesy of Sabrina.